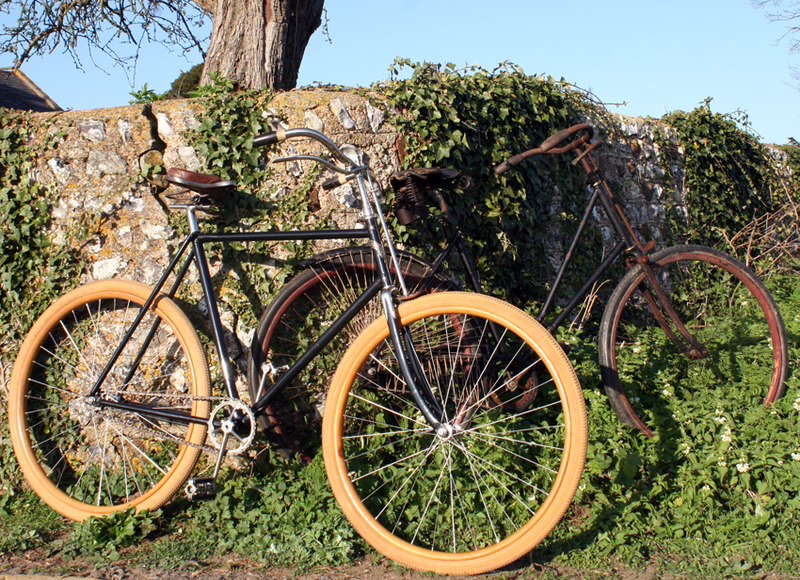 Frenchman Pierre Lallement invented the basic concept of the bicycle in 1865, but had been frustrated by his attempts to market it in America. He sold his rights to Calvin Witty for $10, the price of a steamboat ticket back to France. 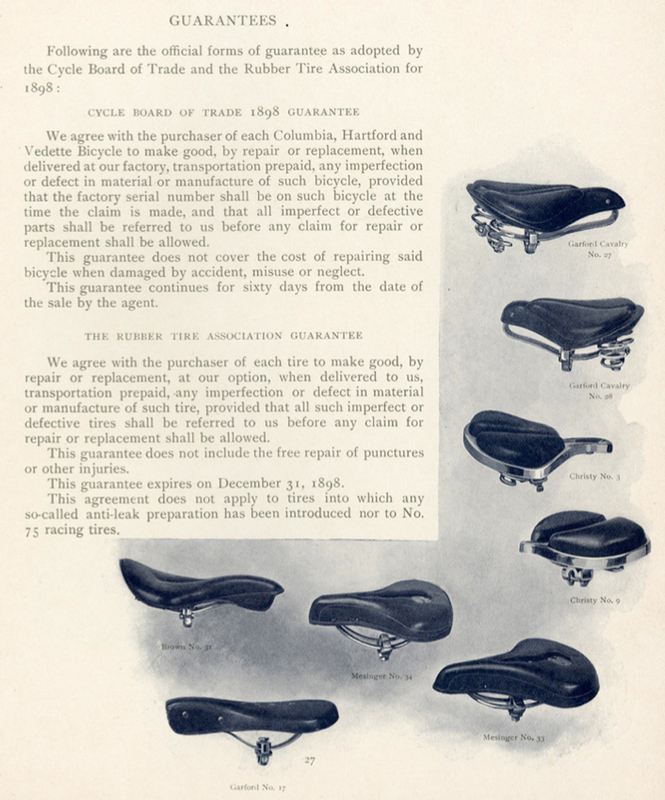 Witty set his royalty claims so high that it was impossible for anyone to manufacture a velocipede at a profit. Eventually Colonel Albert Pope bought this patent, and this gave him the right to charge $10 tax on every bicycle manufactured. But his competitors constantly challenged his right to charge it. 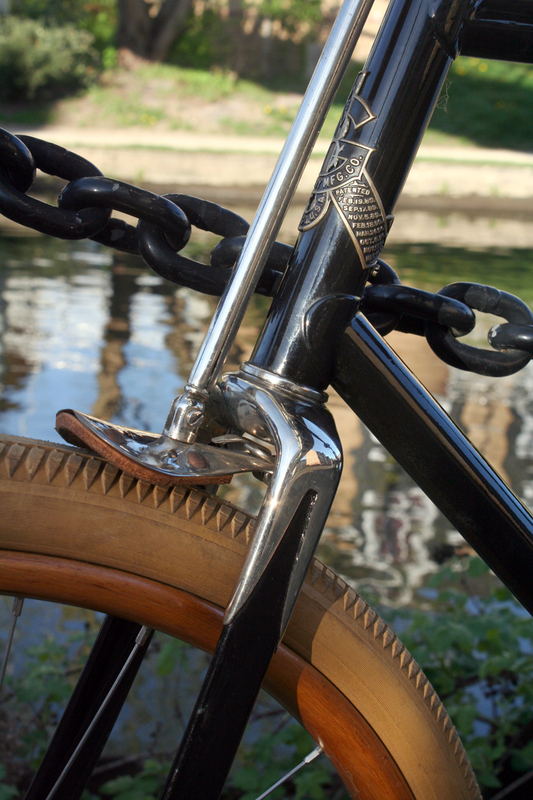 Bicycle manufacturers spent fortunes with the legal profession protecting their own companies and challenging others. 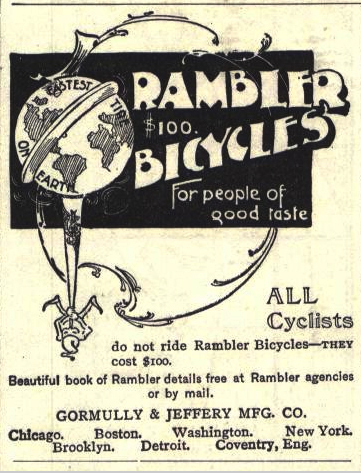 For example, as soon as Gormully & Jeffery introduced the Rambler, a sheriff sent by Colonel Pope swooped down with a lawsuit, alleging they had infringed on Pope’s patent for the crank and the pedal. After several years of pitched battle, however, Gormully & Jeffery prevailed. (Colonel Albert Pope and His American Dream Machines, page 87). 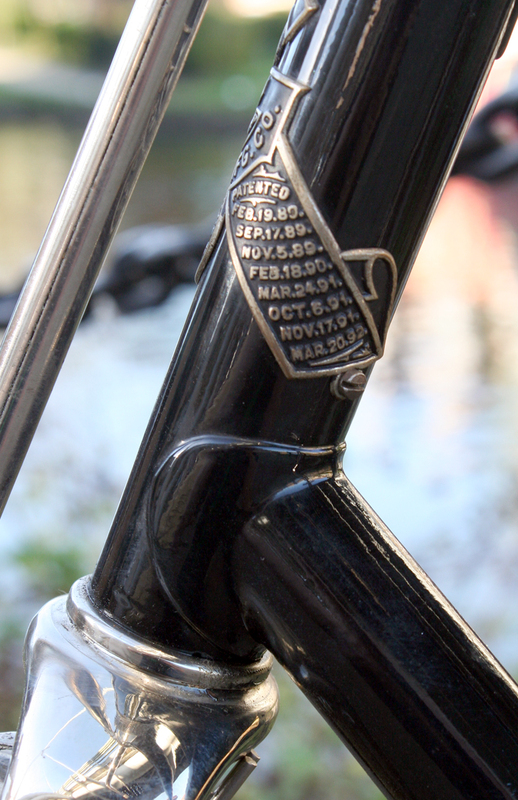 One thing that puzzled me about this Rambler is that the final patent date on the head badge states March 1892. 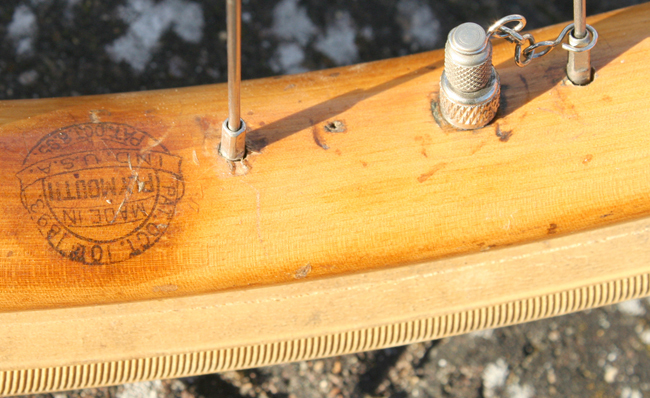 Yet, although a bicycle with the same chainwheel is featured in the 1893 catalogue, it is not offered for sale. I wonder if this is due to the dispute mentioned above? 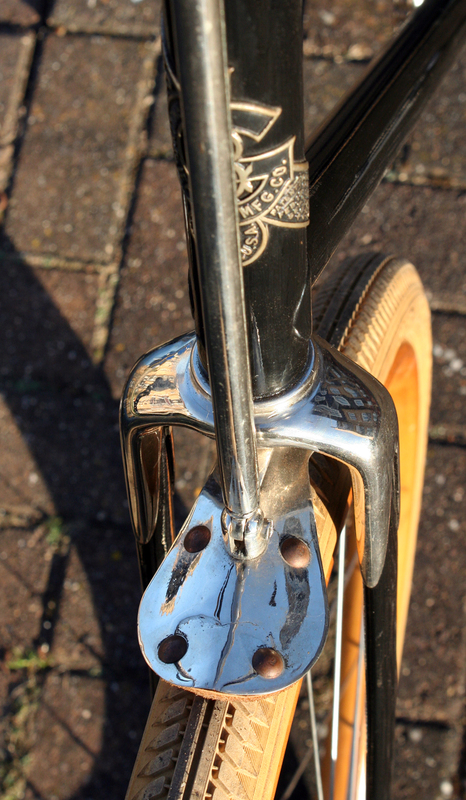 This bicycle is in absolutely superb condition. Most of it was restored ten years ago in America, before being brought over to England by its previous owner Mark, who finished off its restoration. I first saw it while it was in Doug Pinkerton’s workshop last year. 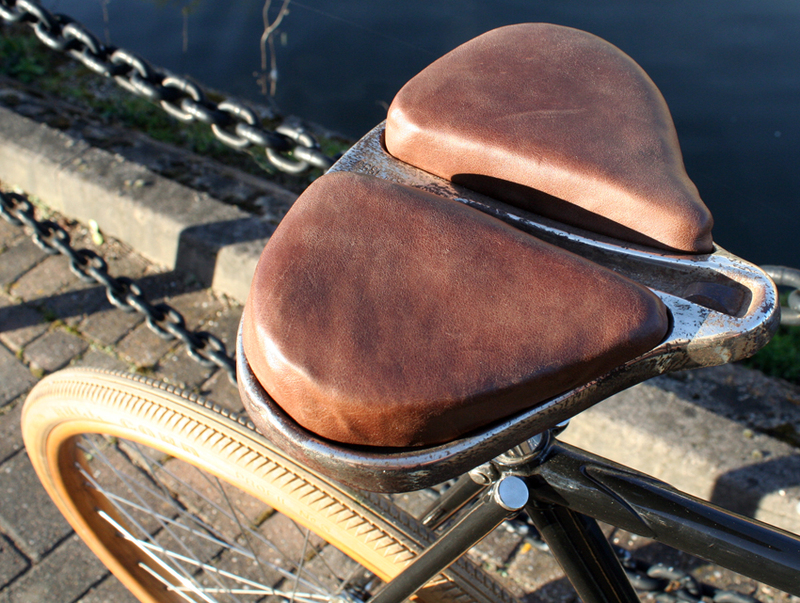 (Doug fitted a new top to the Christy saddle and attended to a few other minor jobs). 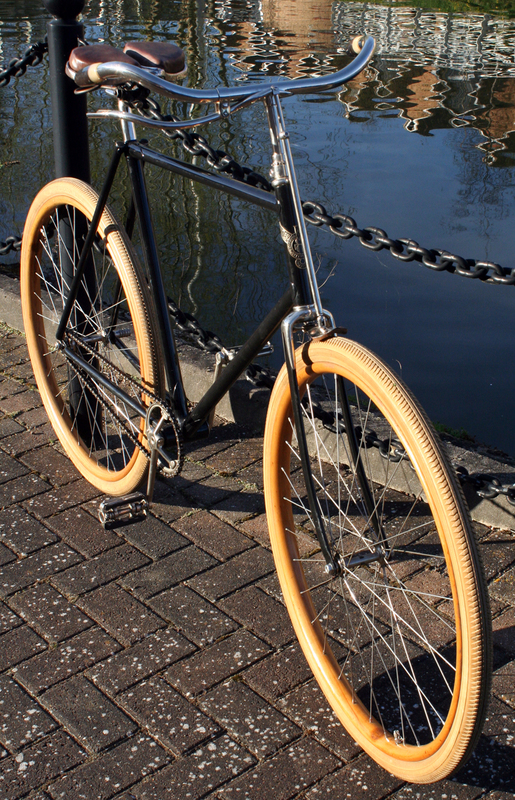 Everybody who has seen this bicycle is astounded by its fabulous condition. And everyone who has seen it wants to own it! 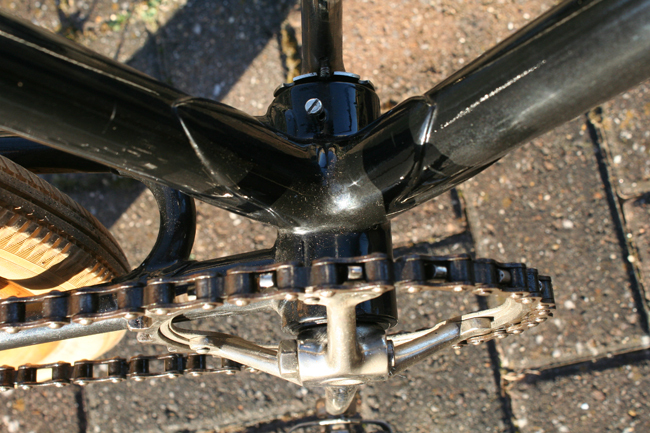 The nickel plating is a prominent feature, particularly the fork crowns, below. 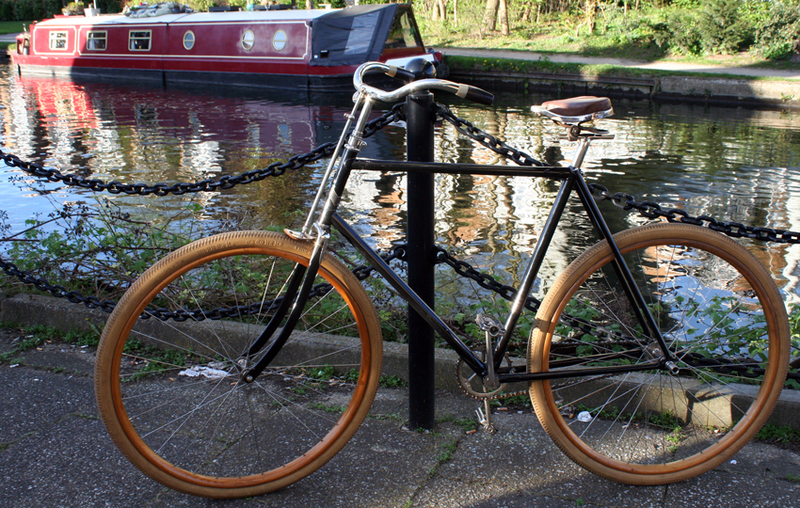 After collecting this Men’s Rambler I stopped off at a tributary of the River Thames for a ride along the towpath. In the countryside, green lanes may still conjure up surroundings from a century ago, but it’s not so easy to find city locations untouched by modernity. 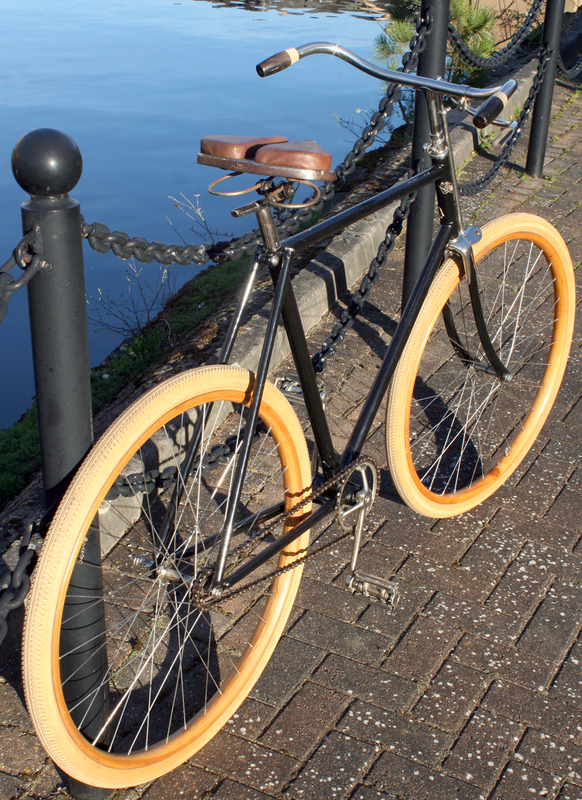 In a built-up area, towpaths are one of the few options for sinking into the saddle of your century-old roadster to soak up unspoilt scenery as you pedal. This Rambler rides very well. 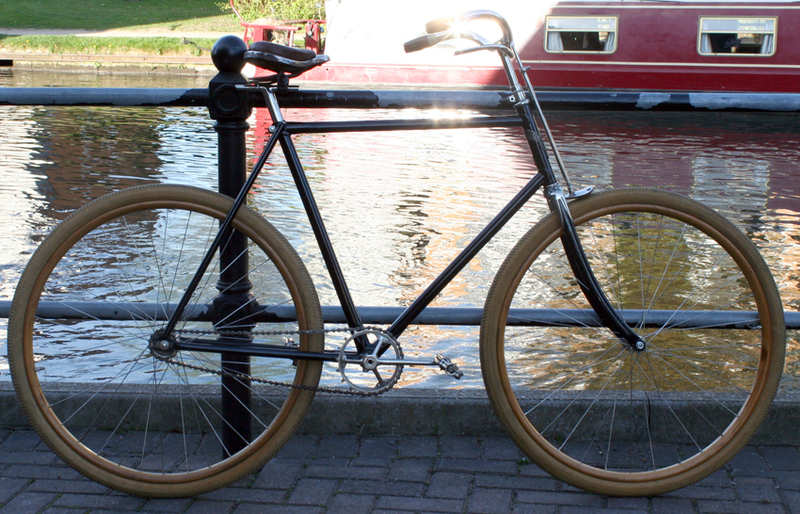 As with other bikes of this age, it’s fixed wheel. 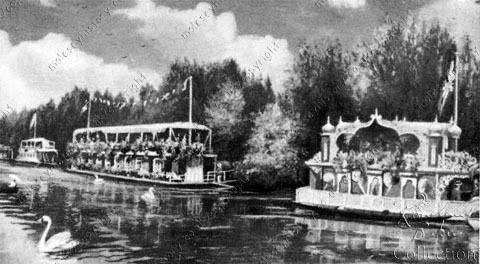 ‘Many people not only frequent the river in their spare time, but even live on it in houseboats…’ says the legend on this painting of exotic weekend floating retreats at Tagg’s Island from the turn of the century. 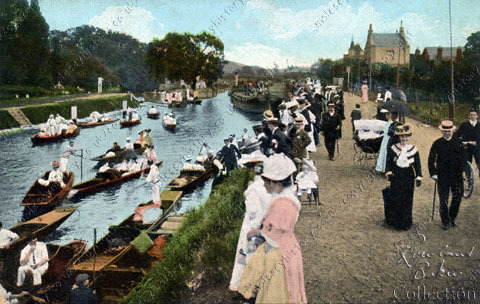 Below is the towpath. 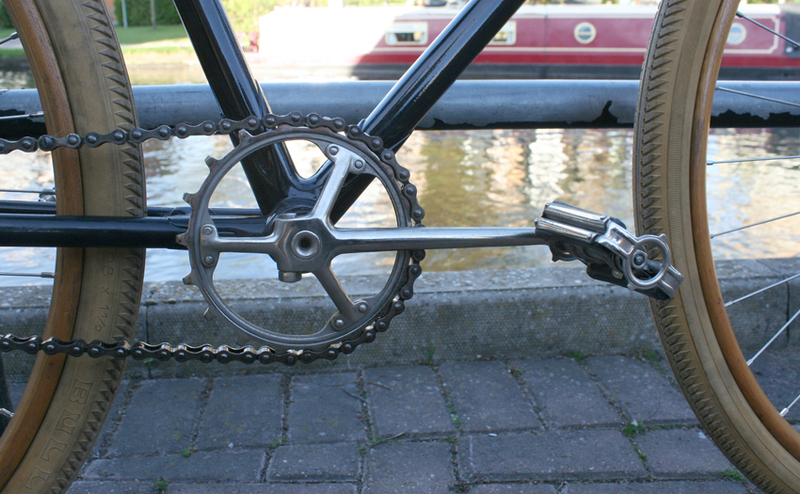 You can see a catalogue illustration of this Rambler’s chainwheel a few photos down the page. 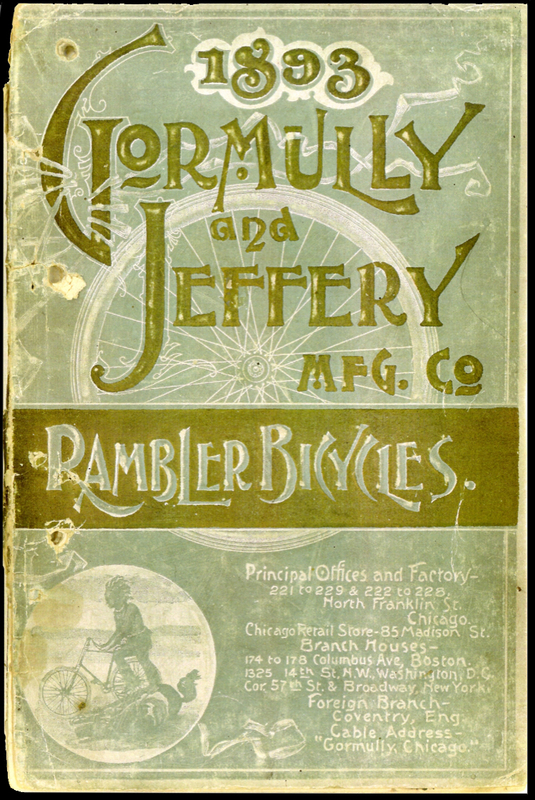 This 1893 Gormully & Jeffery sales catalogue features the old-style large and heavy framed safety bicycles. 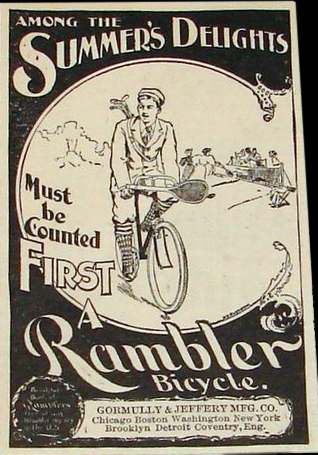 However, at the beginning of the catalogue – though not for sale – is an illustration of the Rambler Racer, above. They were still working on this design in 1892 when the 1893 catalogue was designed. 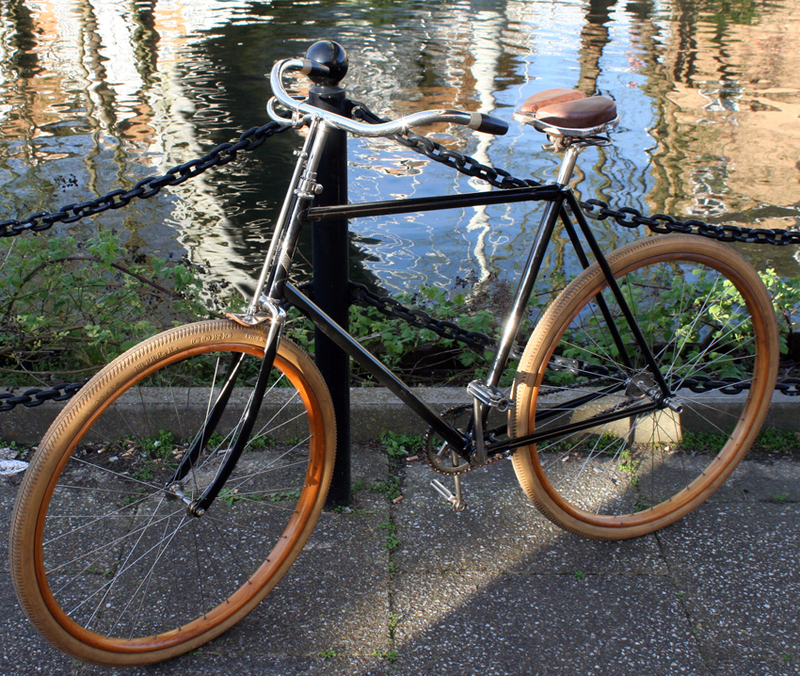 This illustration is very similar to the bicycle featured here. Though it was not ready for the 1893 catalogue, it became the basis of the following year’s model. 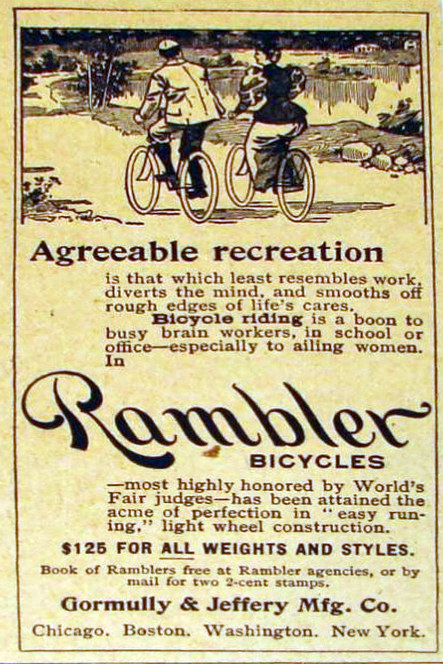 The Rambler was one of the most popular American bicycles of the day. 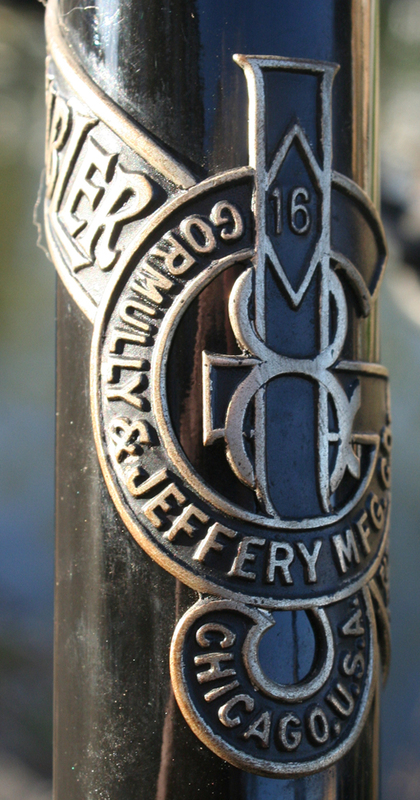 It was very well-made, and of course it was backed by one of the top American bicycle manufacturers. 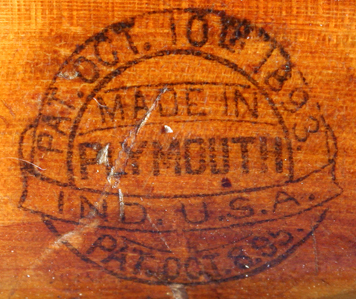 Below, you can see the patent dates: the latest one is March, 1892. 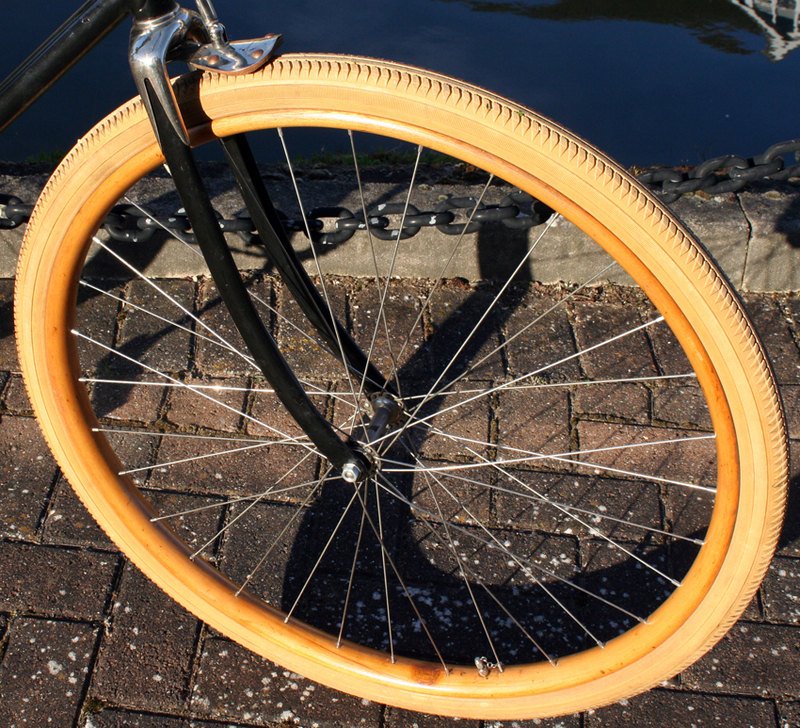 As you can see, the patent date on these wheel rims is October 1893. 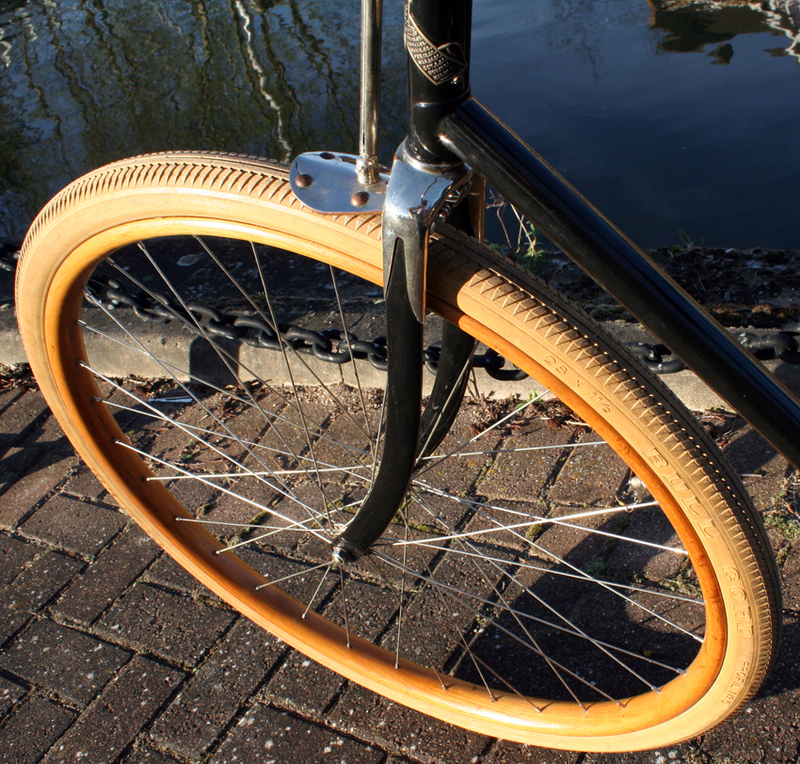 These wheels are really beautiful: they are new-old-stock so have been hardly used. 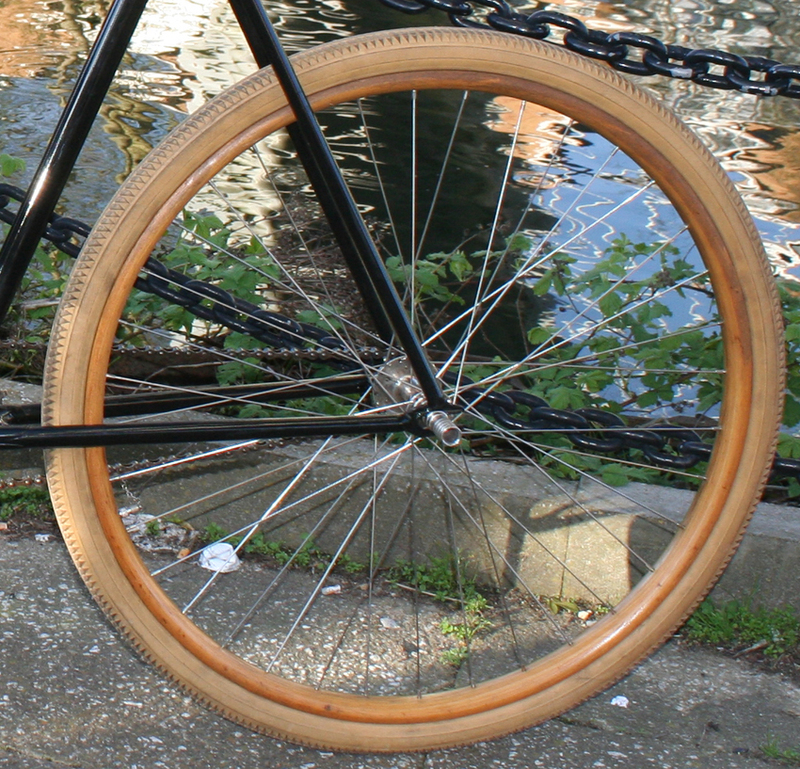 The wheels and tyres match very well, and compliment the black enamel paint and nickelled items on the bicycle. 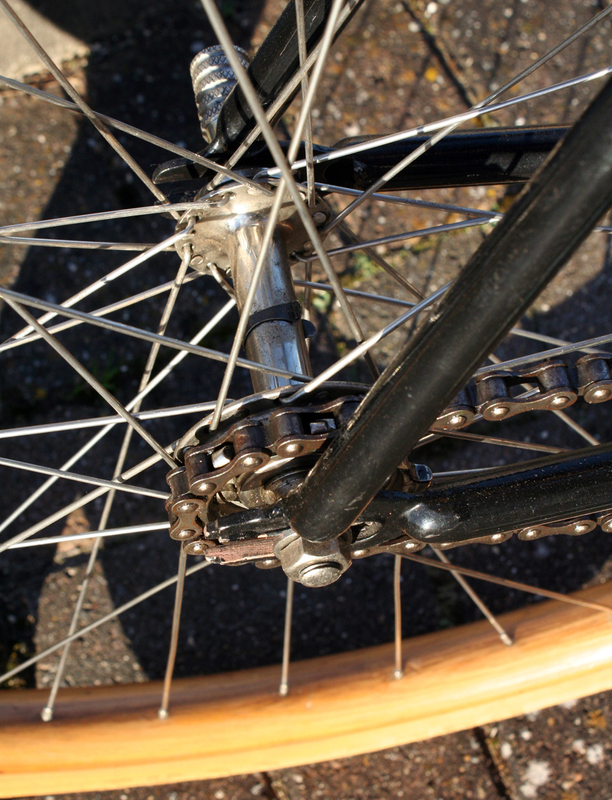 The wheels are fitted with Bull Cord 28 x 1 1/2 pneumatic tyres. 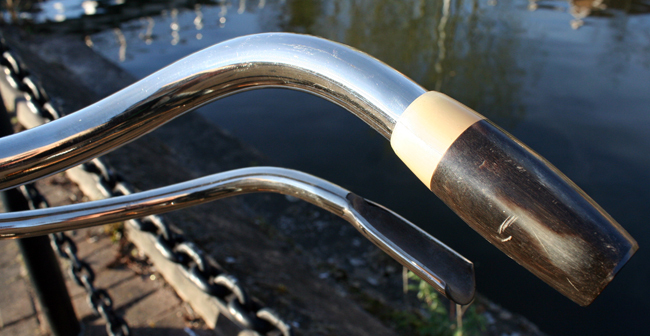 Here you can see the nickel handlebars in greater detail. 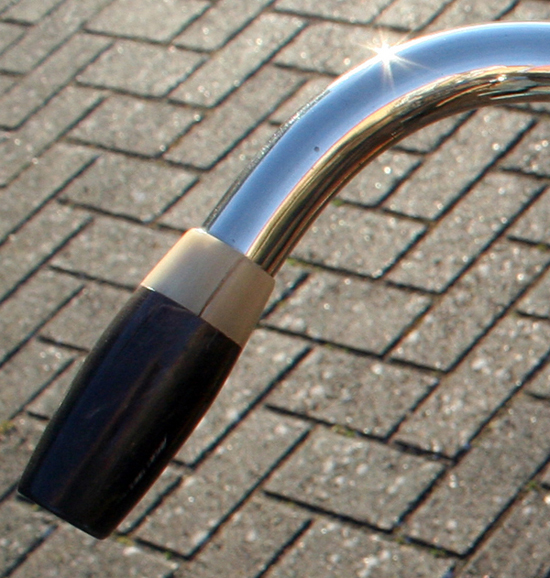 There’s something about nickel which affects us enthusiasts in a strange way. 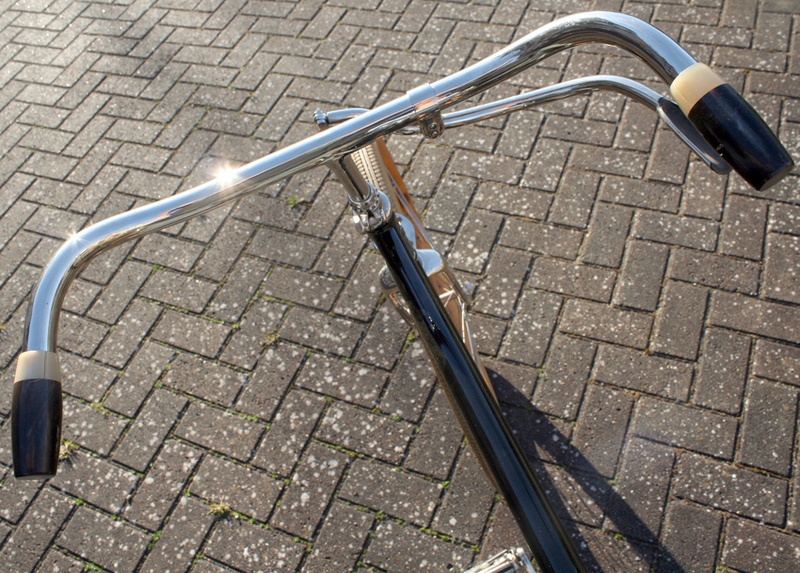 Chrome (which was not used on bicycles until 1928) is very over-stated; nickel, however, is understated and, therefore, much more attractive. 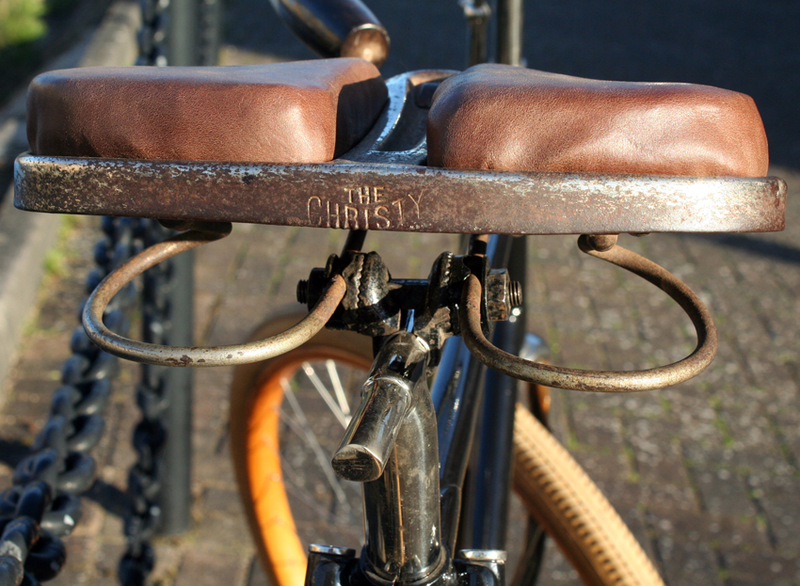 The Christy saddle is a very interesting seat in historical terms. 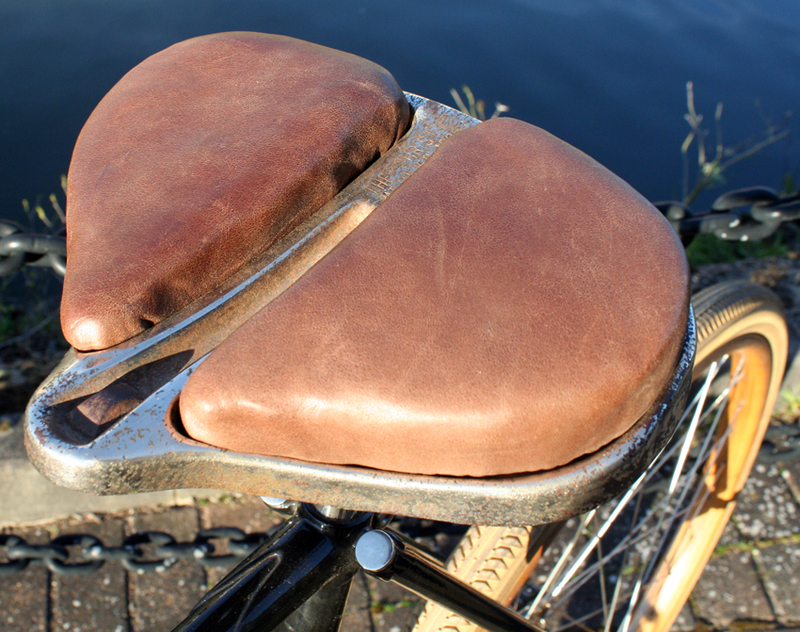 It was actually designed by 19th century ‘scientists’ because of the fear in the conservative Victorian era that women might be enjoying clitoral stimulation from bicycle saddles! AGREEABLE RECREATION is that which least resembles work, diverts the mind, and smooths off rough edges of life’s cares. 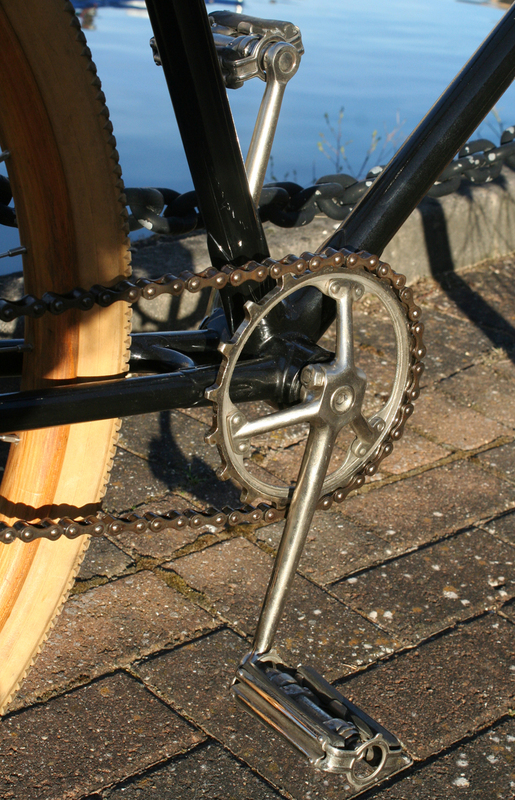 Bicycle riding is a boon to busy brain workers, in school or office – especially to ailing women. 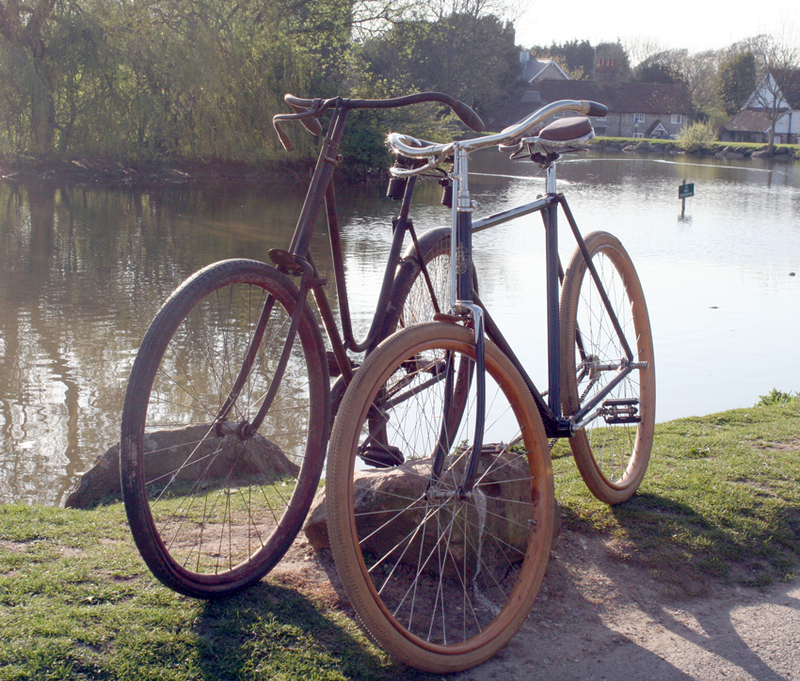 Here are the two Ramblers pictured at Falmer pond. 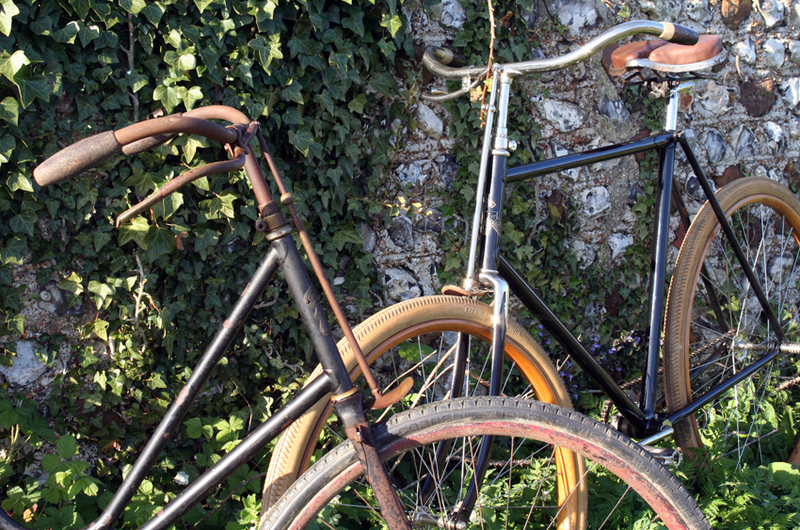 They make an interesting contrast: female and male models; restored and unrestored.